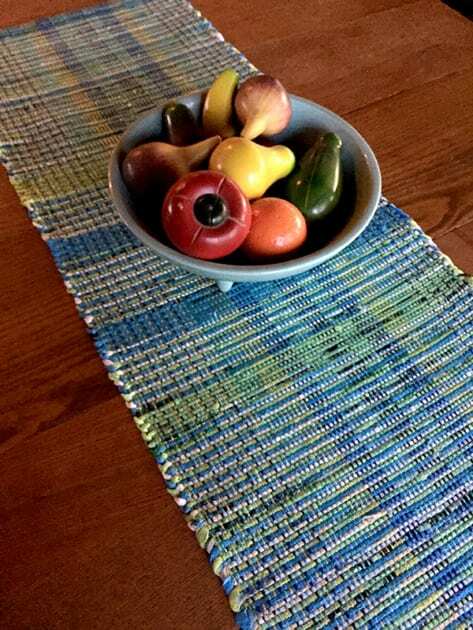 A table runner made by JoEl with woven plastic bags! See a photo below of the process. Rag weaving a craft that always offers a student the opportunity to get in the spirit of upcycling. 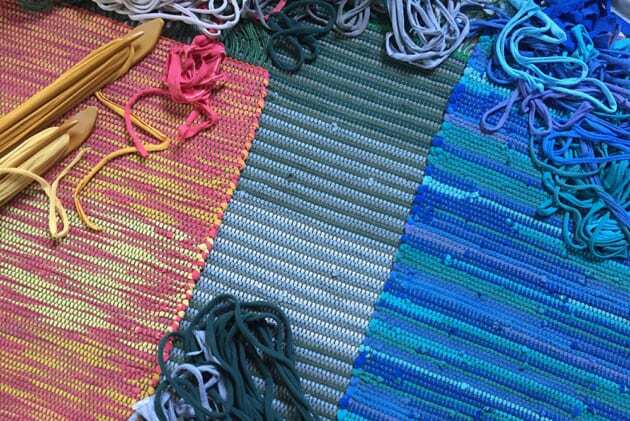 I recently talked with longtime Folk School instructor, JoEl Levy LoGiudice about this sustainable, functional, colorful, and beautiful type of weaving. 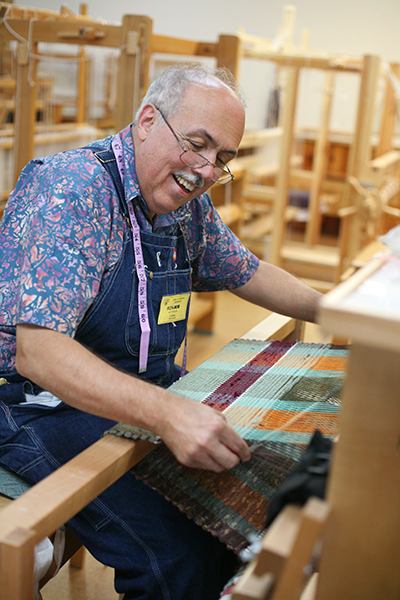 JoEl has taught rag rug weaving, among other subjects, at the Folk School since 1987. 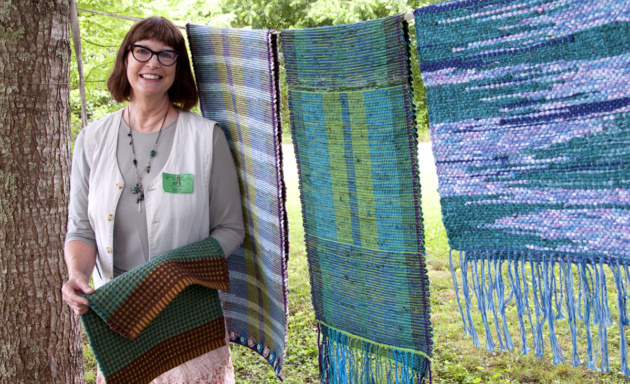 She has two classes coming up: Fabulous Fabric Necklaces on May 17–19 and Woven Rag Rugs and Runners on Oct 13–19. Enjoy our interview! CP: You’ve been teaching at the Folk School for over 30 years! That’s so awesome. 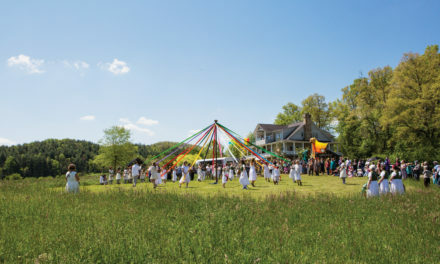 Do you remember the first time you came to the Folk School? JLL: I learned about the school from a former student of mine when I taught at the Appalachian Center for Crafts. Douglas Atchley had recently moved to Brasstown to manage the craft gallery (at that time it was located in the History Center) and he thought I would enjoy teaching here. He put me in contact with Ruth, who was directing programs at that time, and the first class I taught was Appalachian Rib Baskets. CP: Can you tell me one thing that has always remained consistent at the Folk School and one thing that has changed? JLL: The one constant is how Keith House has been the steadfast heartbeat and touchstone on campus. When I first started teaching here the Dining Hall was in the basement of Keith House… there was a much smaller enrollment at that time, but the community spirit still thrived, and you could feel the excitement when students gathered for meals. Usually in the evenings, we all convened in the Keith House Living Room for presentations that were sometimes given by the instructors, and sometimes by the students. Then and now, the drive for lifelong learning brought folks together from all walks of life and all parts of the country. The positive change is how the school has grown. We are getting more and more repeat students. When I am on campus I see so many familiar students. CP: What do you like about teaching at the Folk School? 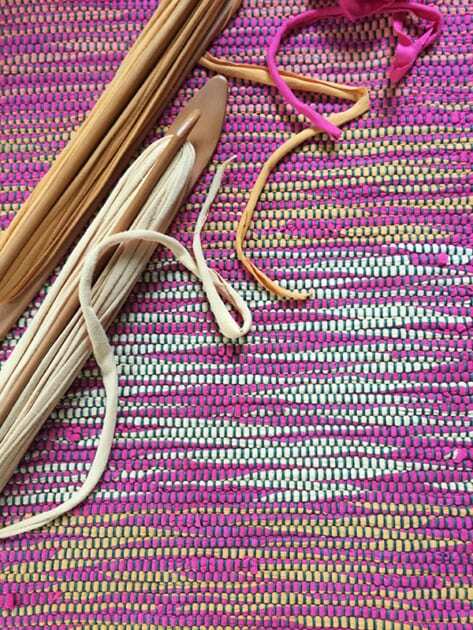 JLL: I am passionate about weaving, so I want to share that love with students. It is very rewarding to see the students empowered by what they have accomplished. They arrive on Sunday and are in awe, “No way I can do this!” they say, but by Friday they are pleasantly surprised by what they have learned and created. They beam with pride… that is why I teach! 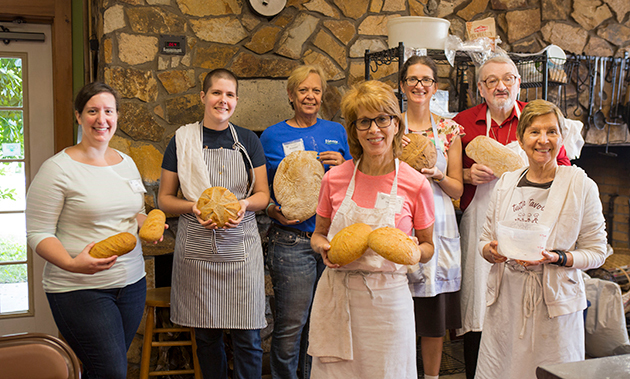 CP: Do you have a favorite Folk School memory? JLL: I have so many wonderful memories, but one that stands out is my 25th wedding anniversary week at the Folk School. My husband Simon and I decided we wanted to do something special, so we enrolled in classes (Simon took Michael Ismerio’s shoe making class, and I signed up for Kay and Tom Patterson’s jewelry class). We stayed in “The Cottage,” which was a luxury splurge, and we had the entire house to ourselves. 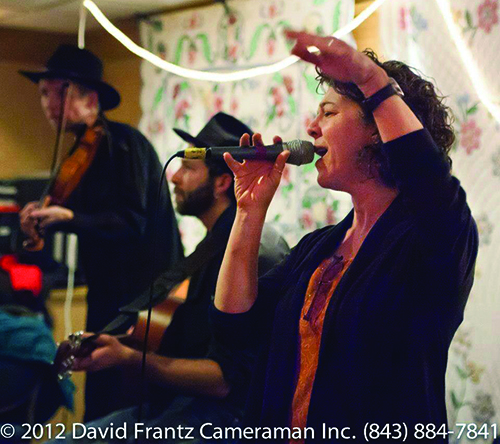 At the end of the week, we had friends from Brasstown and Folk School over for a celebration. While we were toasting with champagne on the porch, we looked out over the field and there appeared a double rainbow… full arch, full blown fantastic color. It reinforced for all of us what a magical place this is. One of JoEl’s classes poses for a group shot in front of the Louise Pittman Fiber Arts at the end of the week. CP: Tell my about the places you have lived. Has craft always been a part of your life? JLL: I grew up in Toledo, Ohio (glass capital of the world), and after college moved to Florida for a decade, then to Tennessee. I live in Ashland City, Tennessee on 13 peaceful acres with my husband Simon, our dog black lab Nina, and Kitt, our spunky cat. Craft has always been part of who I am and what I enjoy. My husband is a graphic designer and woodturner so we both share a passion for the arts and we encourage each other. CP: Tell me your history and journey with fiber arts. Is rag rug weaving the main focus in your personal craft practice? JLL: I studied fiber arts in college and continued my education through workshops at Arrowmont and at various venues in Florida. It was during the time that I taught at the Appalachian Center for Crafts that I began exploring rag rug techniques. I was inspired by my students who had limited resources and who would cut up old clothing to weave with for their projects rather than buy expensive yarn. It is the humble nature of the materials that keeps me focused on weaving with rags. There is so much waste in the world. I am committed to helping students learn the value of recycling… weave it, don’t waste it! JoEl teaches rag rug weaving in the Weaving Studio. CP: Who is the ideal student for your upcoming fall class: Woven Rag Rugs & Runners? JLL: My ideal student is one who is eager to learn and willing to experiment. My classes always include beginners. It is the mix of beginning students with intermediate students that for me sets up the perfect learning environment. We learn from each other and we discover that there is a little bit of teacher in all of us. CP: As a person who sentimentally hordes old shirts, the one advice I hear all the time is, “make a t-shirt quilt!” Honestly, the idea of a t-shirt quilt has always been aesthetically unappealing to me, but the idea of making a rag rug with old band or event shirts is highly appealing! You get to keep the sentimental pieces and completely transform them into a work of fine craft. Throughout your time teaching, you must have seen some really creative usage of personal collections into inspiring tributes by students. Do any projects stand out? A student works on the loom to create a rag rug creation. JLL: The are so many, but I will give a few examples. In one class a student arrived with a load of t-shirts she had gathered from her son. Some were from the days when he was a summer camp counselor, some were from school events. Her son was starting college in the fall and her goal was to create a rug for his dorm room. It was fabulous and a real keepsake. Another time, a student had a specific color scheme in mind for his project. He stopped at every thrift store and Goodwill on his drive to the Folk School. He arrived with a car load of shirts! Needless to say he had plenty of material and wove quite the handsome rug. I was inspired after my January class to weave a rug out of old Fall Festival t-shirts and donate it to the Blacksmith & Fine Craft Auction. So I am putting the call out for Fall Festival t-shirts! If you have some leave them with Mary Doornbos in the Craft Shop and she will get them to me. Cory, now it is time for you to weave a rug with your t-shirts! CP: That’s so cool about the Fall Festival shirts. I’ve been designing those shirts for the past 7 years, so I’ll have to check my closet to see if I have any extras. That sounds like a sentimental project for me as the Fall Festival shirts are near and dear to my heart! Tell me about a sentimental project you have created. JLL: My administrative assistant from my days at Vanderbilt University was getting married and I wanted to give her something very special. I knew she was sewing her dress and all her bridesmaids’ dresses so I asked her to save the scrap fabric for me. I cut up those remnants, added some of my fabric and wove a rug for her new kitchen. She loved it but later confessed that she thought it was too pretty to put on the floor and she hung in on the wall in her living room instead. CP: Historically, is rag weaving from a specific cultural tradition, or does this show up cross-culturally from different traditions around the world? JLL: Swedish, Finnish, Japanese, South American, the Shakers and so many other cultures have rag weaving as part of their resourceful tradition of not wasting anything. CP: What are some of the more unique materials you have seen used in rug weaving? It seems like the ideas could be endless! 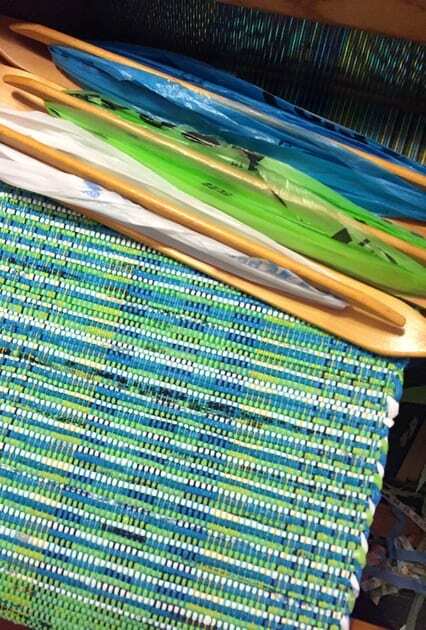 JLL: Plastic grocery bags…I love weaving table runners with cut up bags…they weave up beautifully and the finished piece can be easily cleaned with a sponge. 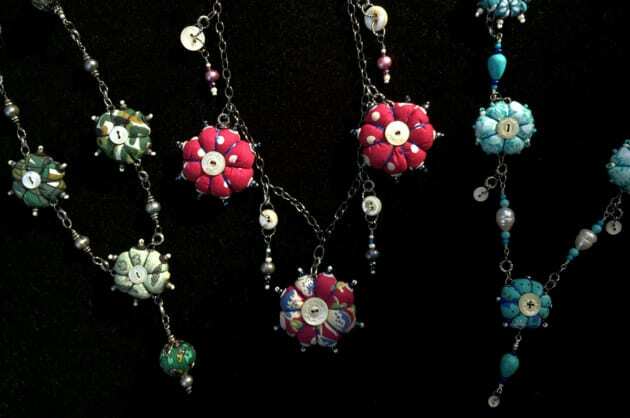 CP: Let’s talk about your upcoming jewelry class: Fabulous Fabric Necklaces on May 17–19. What can students expect? What inspired you to create this class? JLL: I am really, really, really excited about this workshop. We will transform scraps of fabric into amazing jewelry pieces: necklaces, brooches, earrings. All you need is a needle, thread, and some fabric, no fancy equipment required, no previous experience required…an ideal class where learning is fun! When you are a rag rug weaver you have lots of fabric scraps, so I am always challenging myself to repurpose these materials. Creating mixed media jewelry is another one of my passions, so I just married the two. 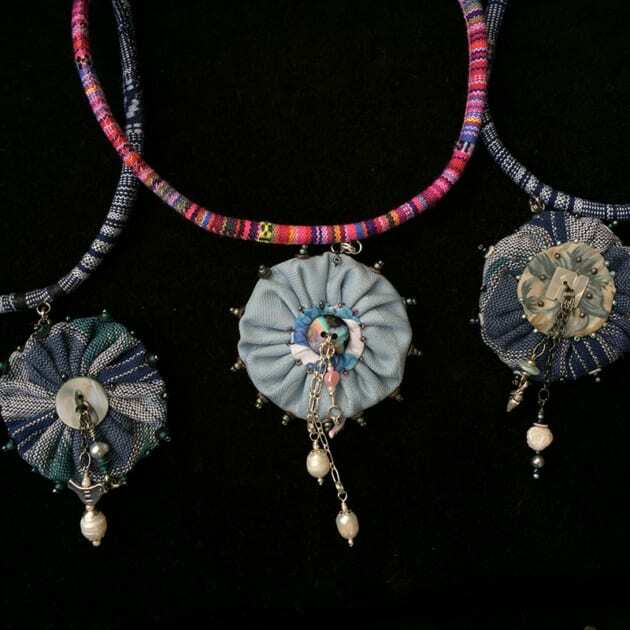 Recycle fabric or use scraps from your stash to create one-of-a-kind necklaces and pendants in “Fabulous Fabric Necklaces” with JoEl Levy LoGiudice. CP: You have the most beautiful and interesting name: JoEl Levy LoGiudice. Is there a story behind why you capitalize the “E” in JoEl? Colorful patterns emerge in a handwoven rag rug. JLL: Of course there is a story! I am firstborn so my parents named me after their mothers. Josephine was my father’s mother and Elizabeth was my mother’s mom. My birth certificate has me listed as Josephine Elizabeth Marie (my mom’s name) LoGiudice. It was my great grandmother who shortened (thank goodness) my name to JoEl. Levy is my married name. CP: You seem to live a very creative life as an instructor, curator, director, fine artist, craftsperson, and gallery exhibitor. You work in a variety of media: weaving, mixed media, quilting, glass beads, jewelry, and more. How have your different creative roles informed your craft practice? JLL: Teaching fibers at the university level required I hone many skills and teaching in the craft environment opened up so many possibilities. I wanted to explore all of it. I have always been drawn to combining media in my work and I am influenced by the many artists I have met over the years while I was a curator and gallery director. CP: I hear you went on Marjorie Langston and Terry Hale’s epic glass bead retreat in Ireland! JLL: I actually went two times for the bead retreats! Terry Hale teaches glass beadmaking at the Folk School. 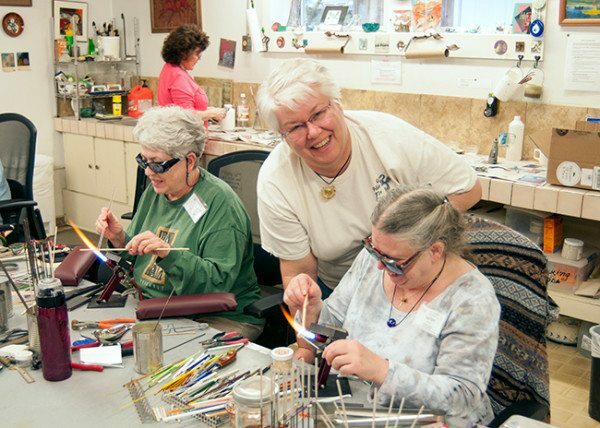 CP: We love Marjorie and Terry (both JCCFS glass bead instructors) here at the Folk School. Did you meet them here at the Folk School? 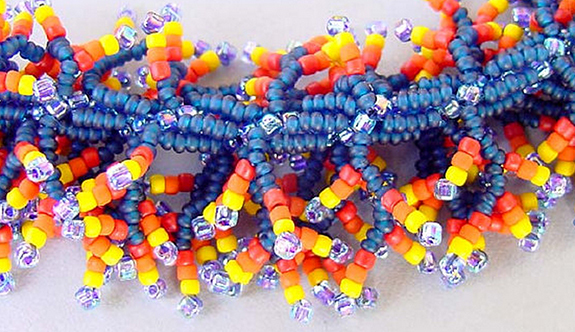 How did you get into beadmaking? JLL: It was over ten years ago that my parents were downsizing. My dad was a research chemist and scientific glassblower. He passed along to me his tools, glass and torches. Before he retired he had started experimenting with creating glass beads. I wanted to encourage this so I began setting up a glass shop at home with two torches, one for dad, and one for me. With my instructor resource, I signed up for a glass bead class. As luck would have it, Marjorie was my first teacher and she opened a whole new world for me. She and Terry have really built and nurtured a supportive glass community. I still consider myself a baby bead artist, but I am so fortunate to be in the company of incredibly gifted artists and teachers. I will be at the Folk School in February using another one of my resources and you guessed it… I am signed up for Marjorie and Terry’s bead class. JLL: Sign up for my May class… bring your friends! I promise you, we will have a great time. Recycle fabric or use scraps from your stash to create one-of-a-kind necklaces and pendants. Begin by stitching and stuffing fabric yoyo circles, and then embellish them with beads, sequins, and embroidery stitches. Combine completed yoyos with colorful cording and simple jewelry fabrication techniques to create wonderful fashion accessories. Join the upcycle craze, and let your creative spirit emerge. Only a bit of manual dexterity is needed. Register today! Decorate your home with the warmth and charm of handwoven items. 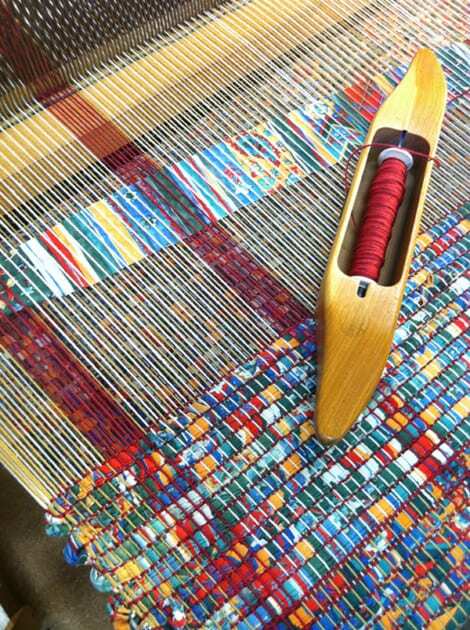 Learn to weave everything from contemporary rugs to placemats and table runners on a four-harness floor loom. This is a great way to recycle fabric scraps, old sheets, and clothing. 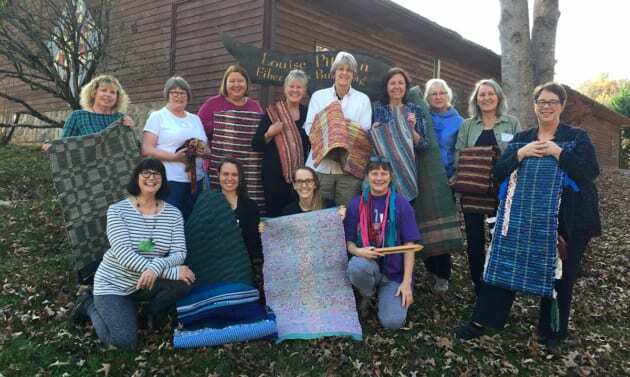 Beginners will be amazed by the easy-to-learn techniques, while intermediate weavers enjoy the opportunity to explore log-cabin and block-weave designs. Register today! JoEl has been a fiber instructor at Florida Community College in Jacksonville, Appalachian Center for Craft, Tennessee Tech University, and Vanderbilt University’s Sarratt Student Center. She has taught workshops in rag-rug weaving at the Folk School since 1987. In addition, JoEl has given numerous workshops throughout the Southeast in beginning weaving, papermaking, and basketry. Her rugs and mixed-media works have been exhibited nationally. Her mixed media fiber work is currently on view through March at the Appalachian Center for Crafts in Smithville, Tennessee. Great interview of a wonderful lady and long time friend! The very first craft experience for both my husband Charley and for me was at the Tennessee Tech campus in 1996 or so. I had a great interest in baskets, while he was very interested in blacksmithing. My instructor was JoEl. It was a wonderful class and we had a great time there. Once we discovered the Folk School, we had found our home away from home. We came every year to take classes and then we both became instructors for many different classes. I still manage to return at least once a year (in July) to one of my favorite places on earth. I am surprised that I was never at the school when JoEl was teaching. I would love to see her again sometime and thank her for that first class experience.